Only six more days until the 184th Semiannual General Conference of the Church! In preparation, today we shall speak of prophecy, adventures, Mormons and…Hobbits! Being the J.R.R. 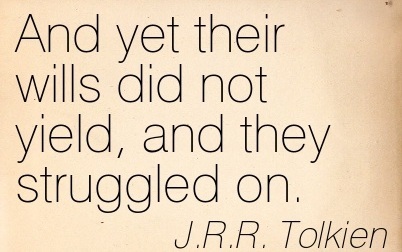 Tolkein / LOTR fan that I am, when I heard this quote, I couldn’t help conjuring up the image of Frodo heading off on his “high adventure” with his courageous band of friends united in The Fellowship. 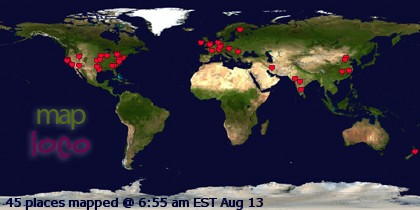 Fellow Latter-day Saints! We are travelling the high adventure road! Together we can”take the ring all the way to Mordor”! Let us each be true and faithful to the “Followership“!! There’s much about Elder Maxwell’s words to ponder. “All the EASY things have been done” Let’s see….The First Vision, the translation and publishing of the Book of Mormon, the organization of the church with only 6 members and building membership by tens, hundreds, thousands and then millions, The Revelations, details, programs and implementations involved with administering the new Church. The persecution and untold sorrows of the early saints being hunted down, having their property stolen, being physically abused, raped, even murdered. Joseph Smith being hunted and persecuted [and eventually martyred]. The Church being driven from state to state and place to place again with no support from the laws they upheld and no protection from their government they trusted in – despite desperate, repeated pleas for justice and protection. The horrible days of Liberty Jail and Governor Boggs “extinction orders”. The crushing blow of Carthage. The tragedy losing beloved Nauvoo. The endurance, hardships and physical toil of leaving all behind, walking a thousand miles across country, headed to an unknown desert valley where they would then have to toil for years of backbreaking work to settle, irrigate, plant, and build. The construction of all of the chapels and temples BY HAND without the use of cranes or electric drills or any of the other modern construction materials or equipment we have today. The work of designing curriculum and programs, unifying the saints, settling all of the Western territory, living the harsh Frontier life. Let’s not forget the early missionary work! Husbands and fathers receiving unexpected calls over the pulpit during General Conference, faithfully rising and accepting and then quickly making arrangements to leave their families behind, usually within days; taking “no purse or script” nor receiving any language training but headed off to foreign lands, sometimes to be gone for 3 or more years. And, the brave women holding down the fort, raising the children, working the farms, going months without being able to receive a letter, and all the while keeping the faith. I could go on and on listing all the incredibly difficult, brave and amazingly hard work of the Church since 1820 … and yet, Elder Maxwell tells us that all of it was “the Easy Things”. “From Now On” … since 1979, we’ve been doing The Hard Things. In comparison to what the “easy things” were, that’s more than a little scary! 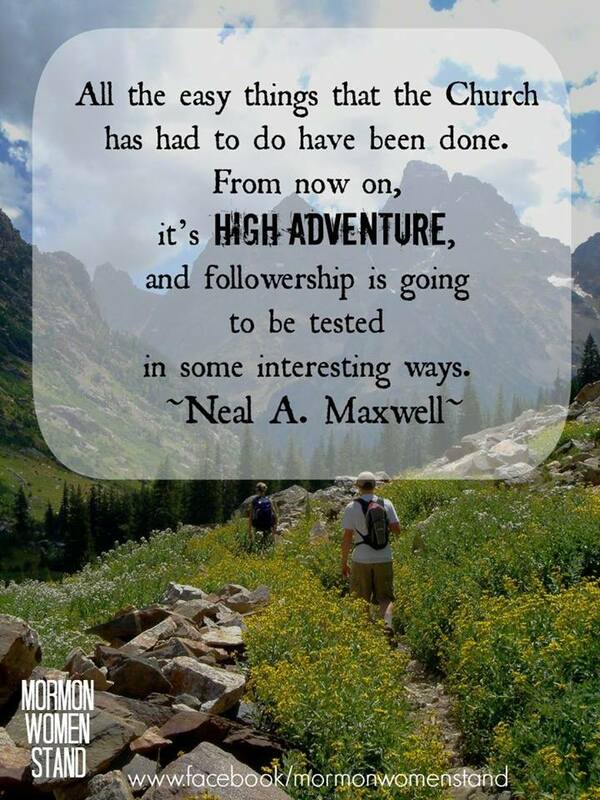 But, I love how Elder Maxwell doesn’t ever use the word “hard”, he uses the words “high adventure“, and “interesting” to describe the road we are meant to travel,with one word of warning; “tested“. Interestingly enough, Maxwell’s forgotten quote from 1979 was recently revived and shared over the pulpit at our most recent April 2014 General Conference, during the Womens Meeting by Sister Linda K. Burton, General Relief Society President. You have been sent to earth in this dispensation of time because of who you are and what you have been prepared to do! Regardless of what Satan would try to persuade us to think about who we are, our true identity is that of a disciple of Jesus Christ! General Conference will be broadcast LIVE and tape delayed from the Conference Center in Salt Lake City, Utah, Saturday and Sunday, October 4 and 5, 2014. Check out a list of options to see Conference HERE. Elder Maxwell sure had a way of wording things, didn’t he? And so do you! Love your posts. Look forward to each of them. I love LOTR, too! Your father and I have been so blessed to be part of the “Hastening” the grandest highest adventure of all. I love this posting Holly. Thank you for your great writing gift. I also loved seeing Terry Dodds post of Pres Monson,”Unless we lose ourselves in service to others, there is no purpose in our own lives.” And that is why we love our mission– there IS purpose in what we do!! According to President Uchtdorf, our semi-annual conference began last night with the General Women’s Meeting, and it was wonderful! So, no waiting necessary! And I do love Elder Maxwell’s way with words. True discipleship is truly being tested, and may we all pass the test. Annie, thanks for your comment. You are correct. I’ve been waiting for official clarification. It definitely sounded from what Pres. 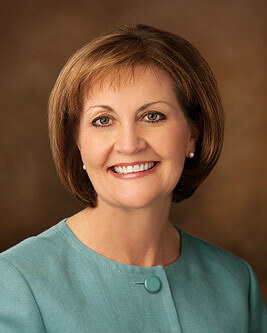 Uctdorf said that Women’s Meeting will now be known as the “first session” of General Conference. If so, will the name of the meeting be officially changed to “Women’s Session” to coincide with “Priesthood Session’? Will the prophet welcome everyone next morning to the “second session” of General Conference instead of the “first”? I guess we wait and see.